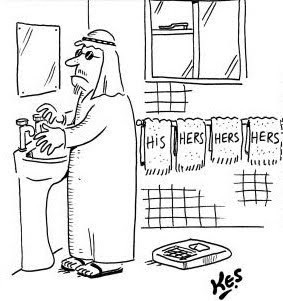 So, I just realized that I told you I think my Saudi neighbor is a polygamist, but never told you why. In case you don't remember and are too lazy to click the link, here's a little refresher. My neighbor is a very high ranking officer in the Saudi military and is here for some kind of training. He, his wife, Al Bundy, and their three children live next to me. His mother and three sisters live in four other houses on our circle. That's right. He's renting five houses in our neighborhood. My first thought when Al Bundy (O.K., it's really Albuundi) told me this was, "Why rent four houses in the same neighborhood? Why not have the mother and sisters live together? And why are the sisters living here, anyway?" But, you know...whatever. They're rich. But then I started walking my neighborhood in the evenings. One night I saw the neighbor's car parked in another driveway. No biggie. Probably visiting his mother or a sister. But then as I passed the house, he was in the doorway kissing a woman who was not Al Bundy. This was not a sisterly kiss. This was like when Angelina Jolie made out with her brother at the Oscars. But, what do I know? Maybe that's how siblings do things in Saudi Arabia. Men hold hands there. Who am I to judge? But as the months went on, I noticed that his car would be at one of the other houses every night. In fact, it would be at the same house every night for a month, and then it would be at one of the other houses every night for a month, and then it would at the third house every night for a month, then back in the driveway next door for a month. Are you seeing a pattern here? So, I could be totally wrong, but my hunch is that one of the women really is his mother, but that the three "sisters" are actually wives. I really, really hope I'm right. I mean, polygamy is no big deal in Saudi Arabia. It's totally legal and there are even laws in place to protect the wives. It's not like we're talking about crazy fundamentalist Mormon break-offs marrying 12 year old girls. Because the thing is, if I'm wrong, this guy has a very disturbing relationship with his sisters. Who says life in rural Georgia is boring?